What is different about the Library Catalogue (NewCat+)? NewCat+ allows you to search the majority of the Library's resources from a single search box and view the results in one list. Search results can be organised in different ways, including limiting to online availability or peer-reviewed journals. You can also save or email your results or export them using reference management tools such as Zotero and EndNote. What is included in NewCat+? NewCat+ includes both the library catalogue and more than 300 of our journal databases. What is not included in NewCat+? Although NewCat+ covers the majority of our resources, it does not search everything. 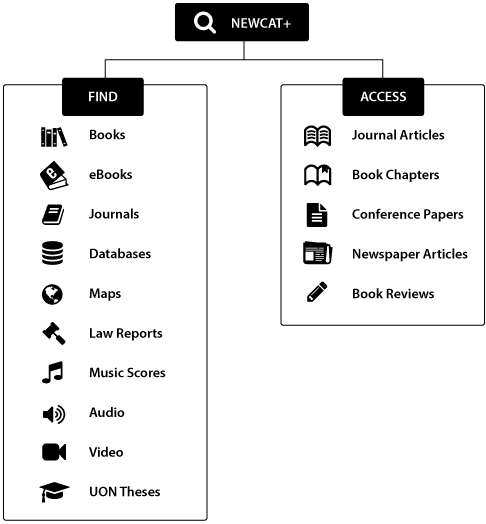 Not all of our online databases are able to be included in NewCat+. As well, there may be times when you will want to search the databases separately - for example, when you need to find publications within a single discipline or use advanced features that are only available when searching the database itself. To find individual databases relevant to a particular subject or discipline use our Subject Resource Guides. If you know the title of the online database you want, you can access it via our alphabetical list of databases. Type your search terms in the NewCat+ search box on the Library's homepage. You can use use a few words, a phrase or a more complex search.